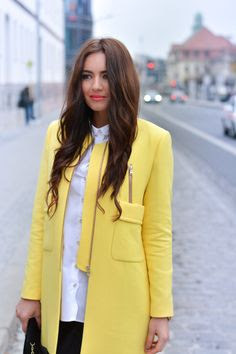 Yellow is a tough colour to wear not just because it can be hard to find the right shade for your skin tone but also because it's a very 'in your face' colour that people really notice...in a hi-vis jacket kind of way. You draw the eye as you walk up the street so there's an extra degree of confidence required to wear it. 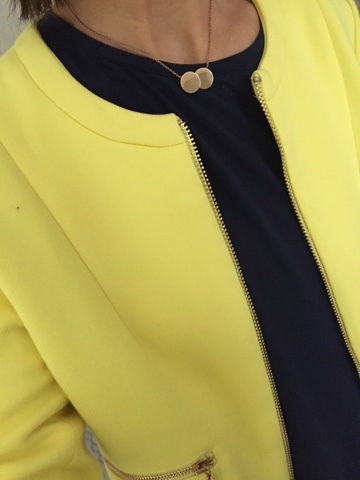 But I LOVE the colour and am really drawn to it so every year I flirt with the idea of a yellow jacket or coat and most years, I buy one and then return it. 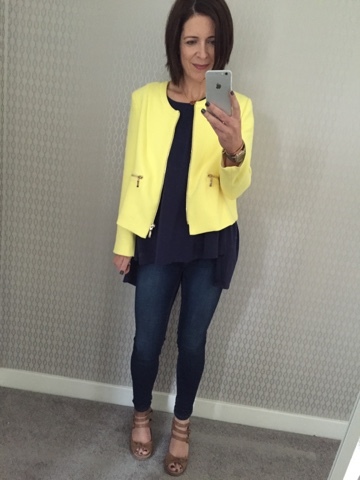 Last year I picked up this yellow jacket from my friend Danielle's boutique in Lisburn and amazingly, I didn't return it. 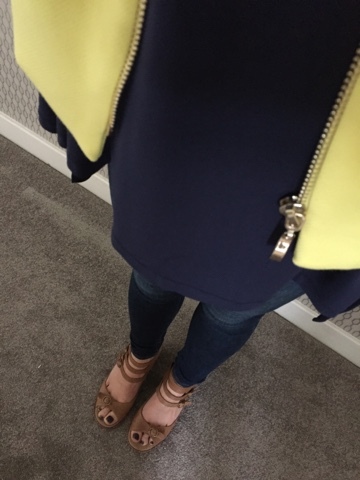 I just love the shape of it and the shade of yellow and told myself I would wear it loads. The truth is I've only ever worn it once, despite taking it out and putting it on several times. Today with an all navy outfit...it was the perfect addition. Yeah? No. I just couldn't leave the house in it...not because I didn't think it looked great. I just didn't think I could pull it off. I caught a glimpse in the mirror on the way out the door, turned straight around and went back upstairs for a navy jacket. I suspect that we all have a few pieces in our wardrobes that we love but just don't feel courageous enough to wear. Why do we keep them? Who knows....but maybe by getting rid of them, we give up on ever having that certain degree of courage you need to pull off a statement piece like this? But for me there's a stronger desire to not try too hard or stand out too much right now as I tick off another year in my 40's this week....I'm loving the pared down simplicity of neutral colours and lines with fewer pieces to mix and match. I'm loving not having to think too hard about getting dressed each day. Believe it or not, I'm loving not stressing about the latest fashion blogger 'must have' and generally shopping less (except for running gear which I can't seem to stop buying). Back to today and wow...what amazing weather AND a bank holiday - win/win. Headed into the city with the twins for a long promised trip to Claire's Accessories (a special kind of torture for parents of girls). But I did manage to nip into H&M to spend a gift card so I'll share with you the fab little top I picked up there on my next post. 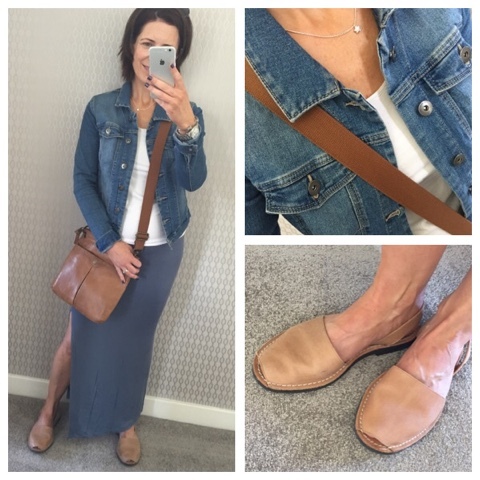 Here's what I wore - an exact copy of an outfit from last week for those of you who follow me on Instagram! Hi Avril, I don't comment very often ..sorry,! but today, I just had to. My first thought as your blog page opened was "wow ... Avril looks great in the navy and yellow!" The yellow jacket really suits your colouring. Yes, I know it's eye catching but you look stunning in it! Having said that, I've done just the same as you, many times! Back to my wardrobe for the safe option! Glad to see you're keeping the jacket, hope you wear it soon! Hi again ..As I pressed published, I remembered the golden yellow tote and clutch I bought a year or so ago. A thoughtful purchase, not impulse! :) I thought how they'd go with navy, grey, black etc and add a touch of colour! Both are good quality leather and I love them ... I think I've used each of them once! Like you I feel they draw attention. Think I'll try again and make an effort to use them as I've just encouraged you to wear your jacket!! I'm gettting more and more like that as I disappear under the swathe of neutrals but ultimately, I want to look nice rather than being totally of the moment. However, I still love to shop - I don't think I will ever lose that habit. 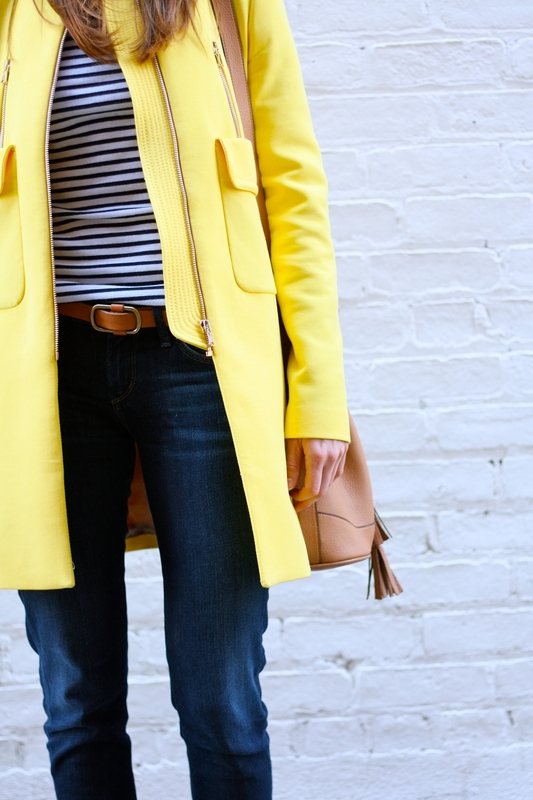 And I bet the jacket will come out again soon - I'd try with a lighter top as I don't think the yellow will come over as "strong". It's funny, I always thought you were quite confident with colour as I know you have a lovely bright coral coat which I think you lovely in. And I looked back on one of your old posts to check out and you're wearing that with a Breton - which I think might be perfect for the yellow jacket. Now ... can you tell me how to get that exercise bug?? Ha, ha, ha! Like Sue, I'd love to know more details about how to catch that exercise bug!!!! But on a serious note, I think she's also right about pairing the yellow with a paler colour. I think that would be easier to wear. It would be a shame to keep it in the cupboard, as it is truly stunning on you! Hi, I welcome the yellow! Can you tell us where the navy top is from please? Wear it!!! Looks fab!! I have a similar one and wear it loads. Yellow will make everyone around you smile and you'll feel better too....honestly!!! Hi, what jeans are you wearing here please?